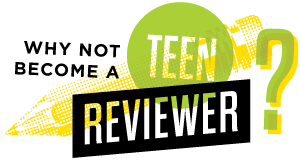 Written by TeenTix Press Corps Newsroom Writer Jaiden Borowski, and edited by Teen Editorial Staff Member Lily Williamson! The Atlas Theatre, where ComedySportz performs, creates a quirky and fun atmosphere by placing paintings by local artists (one depicts Edward Scissorhands giving Chewbacca a haircut) and odd trinkets, such as a ventriloquist dummy that stares down at the audience, around the theater. These purposefully placed objects effectively add a unique vibe to the already unusual space. The referee, who controls the game and gives out points, comes onto the stage to begin the game. The chairs in the back are already full and the murmur of soft conversation was serving as background noise long before I walked into the room. People are relaxed before the referee begins his introduction, and the easy mood of the room sets the tone of the evening. From the start, laughter comes seemingly effortlessly, as the jokes are quick and the audience is ready to have fun. The referee first lays down the base rules, outlining how the game will go. Simply put, two teams of improv performers, each with three people, go head-to-head in improv games and win points based on audience approval. Audience approval is rated by the clap-o-meter, a scale that starts at one, a golf clap, and goes up to ten, a pure wall of joyful noise. One of the more memorable show rules is the brown paper bag rule, which only applies to all-ages shows. This rule states that if anyone, an audience member or game participant, says something explicit that would make six-year-olds sitting in the audience uncomfortable, they must wear a brown paper bag over their head for the rest of that game. This rule was implemented more than once, and it made sure that the show was family-friendly and fun for all. The first half started with a randomly chosen improv game, “Storytime”, which combines the different teams’ storytelling skills to create a crazy, unconventional story. 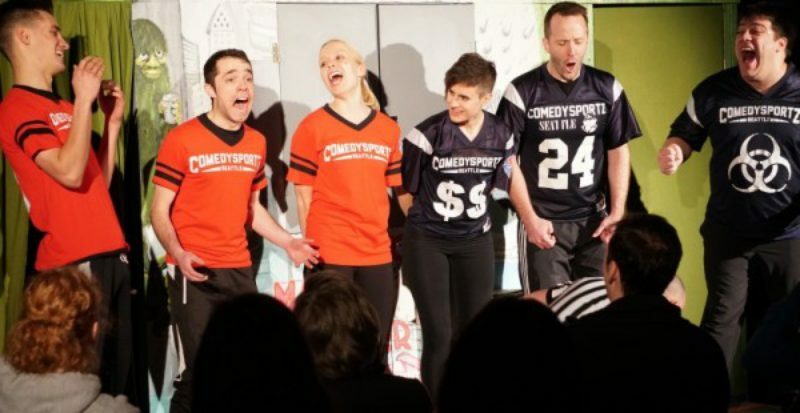 Every ComedySportz show has seven games that are picked on the spot by the team leaders. The randomness of even the game layout creates a unique yet reliably hilarious experience. My favorite game of the show is called Four Things. I hadn’t seen this type of improv game before, and it was quite mind-boggling. In the game, the audience picks a simple action, like golfing, and twist it beyond recognition. Two of the teammates can only explain this action to their other teammate through mimery and gibberish. What I assumed to be an impossible task turned out to be ridiculously entertaining. As the third team member continually guessed correctly, I was amazed at the skill of their gibberish and gesturing. ComedySportz shows make improv, a less appreciated side of comedy, more accessible to a wider range of people. They generally perform at the Atlas Theatre, but also work at different venues, teach classes, provide fun team building, and more. ComedySportz provides a unique way to view comedy that is engaging to anybody. Everyone can find something to enjoy, whether it is the sports game theme, the randomness of the game layout, or the jokes themselves. In the end, one team won by a wide margin, but both teams were smiling and left the audience roaring with laughter. All of the improv games played were hilarious and the audience was involved in every single one, giving suggestions and even coming on stage. ComedySportz is a great way to relax with creatively induced laughter, and it’s made even more enjoyable by the fact that it’s obvious that the actors are having a good time as well. The competition element of a ComedySportz performance offers a backdrop for the amazing improvisation provided by the actors, as well as raising the stakes and investing the audience in the outcome of the games. As the improv actors high-fived us on our way out of the theatre, I knew I would be back again.